This Tuesday, Oct. 7, at 7:00pm, the Groton Public Library will host a public discussion with the authors of the new book, “The Real Cost of Fracking”. The authors, Michelle Bamberger and Robert Oswald, have written extensively on the health impacts of fracking on farm animals and the environment. Michelle Bamberger is a veterinarian and the author of two books on the health and safety of domestic animals. Robert Oswald is a professor of molecular medicine at Cornell and a recipient of the Fulbright & Guggenheim fellowships. Their book has received rave reviews, such as “This work should be a wake-up call to concerned citizens and policy makers alike” (Publishers Weekly, June 23, 2014). You can find more information about the book here. As you know, Groton is the only municipality in Tompkins County to refuse to take action on a fracking moratorium or ban. With Cuomo’s promise to decide on allowing fracking in New York after November, time is running short to convince the town board to establish a moratorium or ban before the state makes its decision. Local bans on fracking have now been established as legal by the state’s highest courts. The Groton town board members have been invited to this event and it would be good for them to see a large turnout of concerned constituents. Also, Michelle and Robert are engaging and friendly and we can learn quite a bit from them. OCTOBER 7 ~ TUESDAY @ 7:00 P.M. This entry was posted in GRAC, News on October 4, 2014 by Mike Goldstein. The Groton town board will hold a public hearing and a vote on a six-month fracking moratorium. The meeting will take place on April 8 at 7:30pm at the town offices, 101 Conger Blvd. Come to the public hearing and let the town board know what you think! 1. The town board has changed for the better. In the last election, a pro-fracking member, Don Scheffler, was replaced by Kelly Smith, who re-introduced the fracking moratorium. We now have a real chance at getting a moratorium passed. 2. As time passes, more and more evidence is gathered showing that hydraulic fracturing is dangerous to public heath and safety. See this summary for a quick overview of some recent studies. As more communities experience large-scale gas drilling in their backyards, they are finding that the industry messages about safe gas drilling are misleading and false, and even the people who initially welcomed fracking are very unhappy with the negative impacts on their lives and property values. As a result, more and more moratoria and bans are being put into place, including in major cities. We need to communicate these new and ongoing impacts to the town board members at the public hearing. Based on their past comments, several town board members rely on attendance at public hearings and meetings as an indicator of public interest in issues. If you want the board to take a moratorium seriously, you need to be at the meeting! For a quick overview on the Groton town board’s actions (and inaction) concerning a fracking moratorium, see the timeline. This entry was posted in GRAC, meetings, News on April 5, 2014 by gracny. The next meeting will be Wednesday, April 16 at 7:00pm at Mike & Jen’s house. Contact us if you need directions. We’ll discuss our recent progress towards a new fracking moratorium in Groton and the next steps in our plan. New members are always welcome! This entry was posted in GRAC, meetings on April 2, 2014 by gracny. Today was a dark day in Groton. The Town Board, having just lost a seat (and almost two) in the recent election, decided to revive their long-tabled fracking moratorium so they could vote it down before the new board member could take her seat in January. As expected, the vote was 3 to 2, with Scheffler, Gamel, and Clark voting against the moratorium, and Sovocool and Morey voting for it. The 3 – 2 vote means that, if they had waited to vote until January, the vote would have been 3 – 2 in favor of the moratorium, because Scheffler lost his seat to Kelly Smith, who is in favor of a moratorium. The moratorium had been tabled since November 2012 when the town board decided not to vote on it because they wanted to first form an ethics board to rule on potential conflicts of interest (some board members have held gas leases in the past). The town board then took until August 2013 to establish the ethics board, dragging out the process far longer than many other New York towns. As was made clear at today’s (December 10, 2013) town board meeting, the ethics board was never asked to consider possible conflicts of interest related to gas leases. In addition, the existing Tompkins County ethics board could have been consulted at any time. Thus the town board could have voted on their tabled moratorium at any time since November 2012. Why delay? They knew that fracking was going to be a hot issue in the upcoming election, and they did not want to go on record with a vote either way. Delaying the moratorium vote for over a year to allow for an ethics board ruling was clearly a stalling tactic. However, the town board’s hand was forced by their loss in the recent election. They knew they had a 3-2 majority against a moratorium, but the majority would change in favor of a moratorium in January. Thus they held a sham public hearing (at which pro-moratorium speakers outnumbered anti-moratorium speakers by a ratio of 4 to 1) and immediately voted against the moratorium. The vote was a bald-faced political move by a majority that no longer represents their constituents. It was also a pointed attempt to deny the incoming board member, Kelly Smith, a voice in the debate. What is the next step in this fight? Find out more at the next GRAC meeting on December 18 at 7pm at Mike and Jen’s house. Contact us if you need directions. This entry was posted in GRAC on December 10, 2013 by gracny. The Groton town board just announced (with an absolute minimum of public notice) that they will hold a public hearing and a vote on the six-month fracking moratorium that they tabled over a year ago. The meeting will take place on Dec. 10 at 7:30pm at the town offices, 101 Conger Blvd. Please come and voice your opinion to the town board! After over a year of stalling, why are they suddenly motivated to hold a hearing and a vote? The town board members have repeatedly claimed that they do not think a moratorium is necessary. Perhaps their motivation comes from losing the recent town board election. The winner was Kelly Smith, who is against fracking and in favor of a moratorium. Many people think that the town board’s sudden interest in the moratorium may be an effort to vote it down before Kelly gets a chance to join the board in January. This entry was posted in GRAC on December 4, 2013 by gracny. 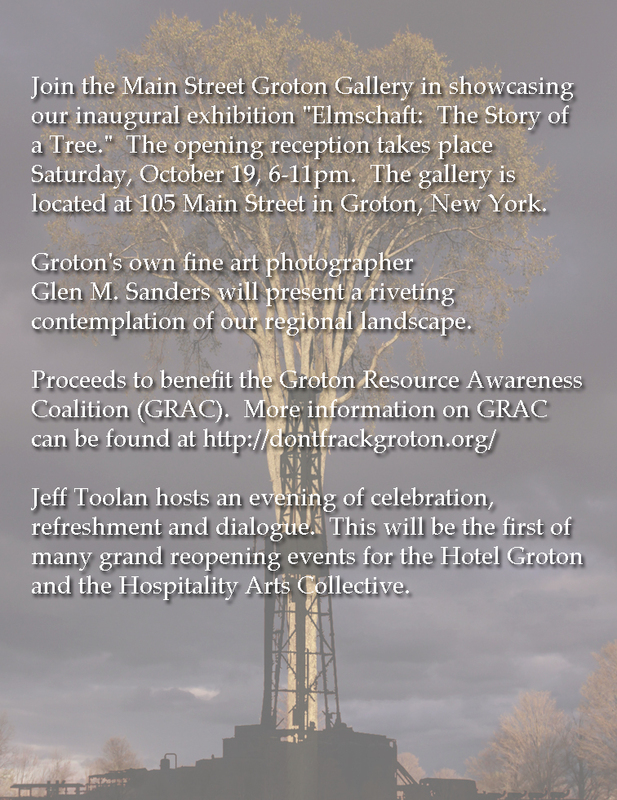 The newly reopened Main Street Gallery (105 Main St., Groton) will host a GRAC fundraiser on October 19 from 6 – 11pm. The event will be hosted by Jeff Toolan and will feature the work of Groton photographer Glen M. Sanders. The image on the right will be printed as a limited-edition poster and sold in black-and-white ($10) and color ($25) versions, with a portion of the proceeds benefitting GRAC. This event is important both for GRAC and as an important step in revitalizing downtown Groton. We hope to see you there! This entry was posted in GRAC on October 14, 2013 by gracny. Join GRAC in the Groton Olde Home Days parade on Saturday, August 17! GRAC will have a float in the Groton Olde Home Days parade! You’ll know our float when you see it. 🙂 Join us in the parade and add your voice to the growing number of residents who demand that the town board take action to pass a moratorium or ban on hydrofracking in Groton! The parade will line up at 5pm on Saturday, August 17 on Route 222. We are towards the back of the parade. Come by our table in front of Bun Appetit on Saturday for more information. This entry was posted in GRAC, News on August 15, 2013 by gracny.